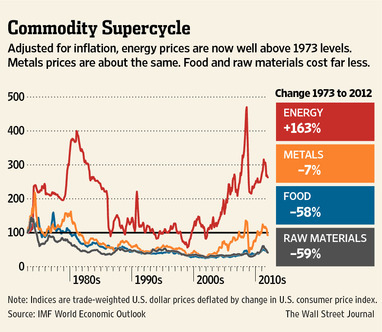 David Wessel’s economics column at the Wall Street Journal takes a look at an IMF analysis of commodities prices since 1973. In the process, he makes an odd claim about energy prices. Commodity prices since 1973 from the IMF World Economic Outlook. But the IMF charts illuminate a bigger story. • Something significant did happen in the 2000s: a sea change in what had been a downward drift in prices of commodities (other than energy) for decades. The consensus explanation: Demand from China, India and other emerging markets grew very rapidly as these big economies sprang to life…. • Energy prices are truly different. For one thing, they are much more volatile than other commodity prices for all sorts of reasons, including recurring geopolitical risks that oil supplies will be disrupted. For another, they are clearly rising—up 163% over the past four decades. The consensus explanation of energy’s exceptionalism: Rising oil prices depress economic growth and that depresses prices of other commodities. • Metals prices have risen significantly in the past several years, as the IMF chart shows… Still, metals prices are roughly where they were in 1973, a clear contrast to the price of energy, which appears unlikely to ever be as cheap as it was then. • Over the past several decades, the price of food is down substantially—despite the growth in the world’s population and the well-discussed change in the diets of the increasingly prosperous Chinese, and even after the uptick of the late 2000s. Food prices are roughly half what they were in 1973. Half. That long-lived trend is likely to continue. Why should we believe “this time it’s different” about energy prices? It seems an especially odd claim given the near two-decade period from about 1985-2003 during which energy prices were essentially the same as in 1973. That can’t happen again? Maybe we’ve reached the global limits on energy-resource productive capability, but I doubt it. Instead I think we’ve seen significant growth in energy demand over the last decade or so, more or less exhausting any excess capacity (or, in economics jargon, the energy demand curve is now intersecting with a relatively inelastic portion of the energy supply curve). Energy supply has been increasing in response, but the effort is slow-moving, so we get higher and more volatile prices in the meantime. My guess is that we will see inflation-adjusted oil prices back at 1973 levels within the next five years. RELATED: The recent IMF World Economic Outlook analysis that inspired Wessel’s column. There’s a good reason that energy prices are up more than metals, and metals are down less than food and agricultural raw materials. Energy is produced almost exclusively from nonrenewable source, and because of the laws of thermodynamics, cannot be recycled. Hence energy will be a depleting resource until we switch to renewables, and the natural long term trend for its price will be up unless technology improvements can reduce it. Yet all these categories are subject to downward price pressure from technology, so the relative rise in energy prices still makes sense. Metals are also non-renewable, but they are widely recycled. This recycling puts a damper on the trend at work in energy, but to the extent that it is not recycled, the trend should be up, at least relative to food and raw materials. Food and agricultural raw materials are completely renewable, and so their price should be flat before technology improvements, and decreasing after technology is taken into account. That’s why history won’t repeat itself. Tom, you have an appealing and straightforward claim, but I’m not sure we are near enough any global constraints imposed by the laws of thermodynamics for it to be relevant. After all, the laws of physics presumably have been invariant for the whole of human history and most of that history has seen energy prices falling. Certainly, in some suitably long time scale, entropy must overtake the universe, but what is the evidence we are near the critical limit? If we consider oil, coal, and natural gas separately, two out of three of those finite fossil fuels seem pretty cheap these days, at least in the U.S.
Maybe we have reached or are passed some ultimate energy tipping point where prices are now trending up, but I’m still leaning to the view that recent price spikes are produced by a relatively short-lived (~10 year long?) bumping up of energy consumed against current global energy supply capability. I haven’t thought much about metals, but (or perhaps “therefore”) my attitude is similar. We may be accessing easy to reach metals and turning them into harder to reach metals by making them into products that wear down and are discarded. Ultimately it seems like this is a one way street,but so far indicators of scarcity point to diminished scarcity rather than increasing scarcity (at least over longer-run periods). So, one of these days “this time is different” will become true, but I’m not sure why we should expect it to be this century rather than next. The whole of human history is not relevant to my argument, only the 400 years or so since we began to use nonrenewable fuels. In terms of coal and gas being cheap, if that is the case, why is the IMF Energy index going up? You seem to be arguing from a local phenomenon (US nat gas glut) to reach a worldwide conclusion. In contrast, seaborne LNG prices are up recently because of increased demand from Japan. I believe seaborne (i.e. internationally traded) coal prices are also up, although I’m not sure where to find data on this. So by my count, 2 or 2.5 out of three major fossil fuels are more expensive. In response to the “why now?” question, the answer becomes more clear when you consider the rate at which we are using nonrenewable resources. In 1940, the US was producing 480 million tons of coal a year. Today that number is 1.09 Billion tons/year (EIA). So, given no other information, we’re more than twice as likely to reach the entropic limit for coal in 2012 than we were in 1940. A similar argument applies to oil. In 1981, world oil consumption was 61M bbl/day, today it is 85M bbl/day. So we’re 40% more likely (again, assuming we had no other data) to be hitting the entropic limit today than we were in 1981. Why will the entropic limit be reached this century? Because time (as counted by resource depletion) has sped up.